(C) a 43-image step-by-step “photo shoot” from Eitel-McCullough Inc. covering wartime production of the VT-158 “Zahl” radar oscillator tube. The RCA information is from a series of 37 binders in the Dowd-RCA archive, a holding of the AWA Museum. The EIA data were contributed by the EIA without an index. Jim Cross and a doughty band of researchers opened each of the 7000 PDF files to determine their contents. The disc contains comprehensive indices covering tubes and semiconductors. (The “Data Cache” is not termed a “Tube Data” repository because it includes about 17,000 entries on semiconductors, from 1B21B through 6N104A.) The EIA releases provide data sheets on products from 243 manufacturers, domestic and foreign. Some are household names; others are totally obscure. The disc comes with an eight-page booklet covering the capabilities and limitations of the files. 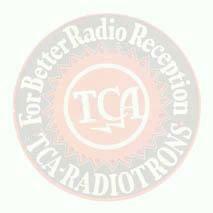 The price of this package, orderable from TCA at its Ashland address, is $50 postpaid ANYWHERE. Your editor will be pleased to supply further information as desired. For convenience, you may use PayPal.